You are reading this now because you have been coming across these words (Digital Marketing, Online Marketing) quite often in your personal and professional life. Well, you have come to the right place. 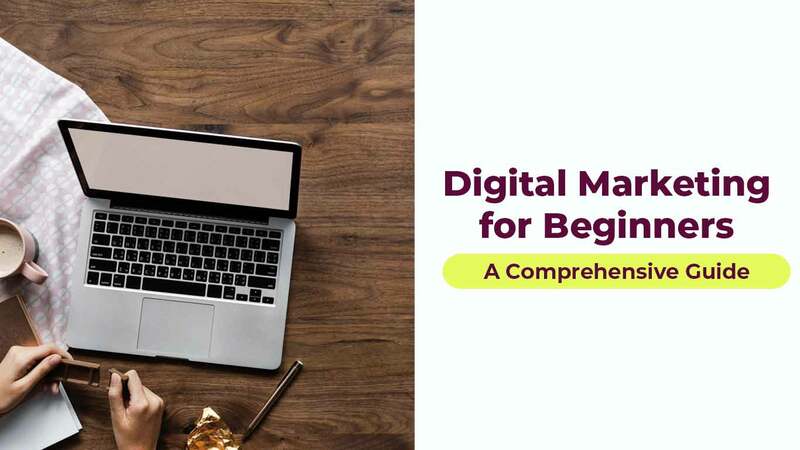 This blog post is all about Digital Marketing for beginners. Don’t worry even if you have zero idea about Digital Marketing, I’m going to give you an overall picture first and then break down slowly into its various branches. First of all, Digital Marketing, Online Marketing, Internet Marketing and Web Marketing are all similar terms that are used interchangeably. In this article, we will be using the term Digital Marketing as the standard one. Even though there are many definitions available on the internet, we will go with a simple one mentioned by Financial Times Lexicon on their website, which Google also shows as one of the top search results. According to their definition, Digital Marketing is the marketing of products or services using digital channels to reach consumers. The key objective is to promote brands through various forms of digital media. That being said, if you look at various articles on the web, some would have given Digital Marketing a broad sense. They would have included things like SMS marketing and digital display boards under the term Digital Marketing. In this article, we are concentrating only on internet-based marketing techniques that majorly own the term ‘Digital Marketing’. Largely, Digital Marketing is based on various channels (web-based platforms/websites) that we use on the internet. These channels include Social Media sites, Search Engines, Blogs, Emails, Mobile Apps and many other websites. 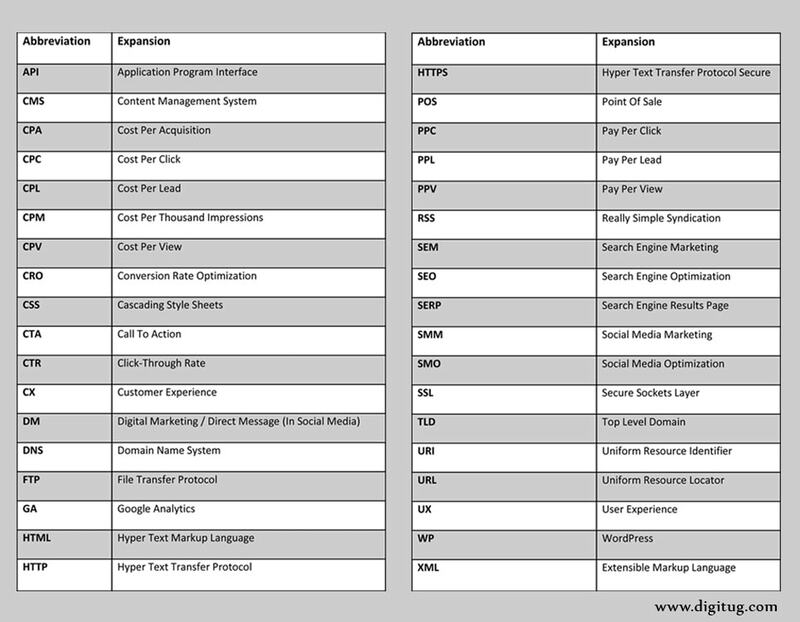 So based on these channels, Digital Marketing has the following six divisions. As a beginner, it is always a good idea to make a note of these abbreviations (like SMM & SEM given above) in the Digital Marketing space, as you would be coming across them more often. This small table given below will have you the important ones covered. Going through these six important divisions of Digital Marketing will give you a better understanding of the various techniques involved. We will see each of them in detail in the coming sections. We will take Social Media first, as it is the most talked about one. Social Media sites are generally used by people to interact with fellow beings, stay updated with their life events and also to share a lot of personal content, including images, text, videos etc. Along with this personal content, there are brands dominating Social Media by sharing their product updates and advertisements to better reach their prospects and customers. We will look at the top Social Media channels used by brands and marketers to reach people. There are many other Social Media channels that are used by people and brands in various parts of the world. Each Social Media platform is different considering its functionalities and target audience. For explaining the key aspects of Social Media Marketing, we will look at Facebook, Instagram and LinkedIn in this article. The very first thing that we need to understand about Social Media is its context. Every channel out there is different in its context. For example, if you have a very attractive image, you can post it on Instagram. But the same may not be applicable with LinkedIn which is more career oriented. In Facebook, just like you have your personal profiles, pages can be created for brands. Your brand’s Facebook page will tell a lot about how you are valued. The posts that you have on your page’s timeline, the number of likes, number of shares and reviews will decide your popularity. Optimizing a page for business. Taking care of the paid ads. 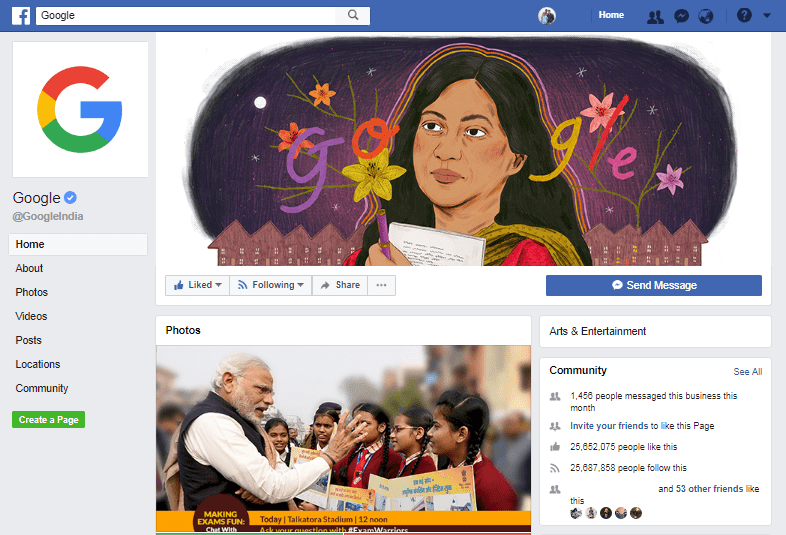 Optimizing a page for Facebook includes setting a proper name, profile picture, cover image, about section and also ensuring quality content. All this doesn’t involve any kind of paid methods. But optimizing a page with quality elements will certainly improve the number of likes you get. Then there are paid methods that we can employ on Facebook. 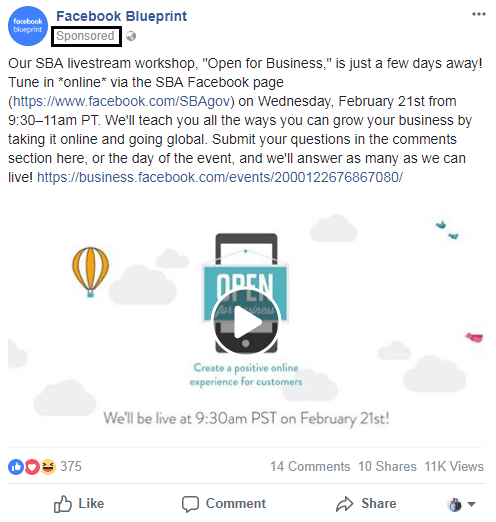 As a matter of fact, for brand pages the organic (non-paid) traffic is going to come down (as per Facebook’s new changes) and the traffic to your page will be more dependent on the paid ads that you give in the coming days. Facebook ads follow a PPC model. PPC stands for Pay Per Click. You pay every time someone clicks on your ad. Facebook has great targeting options that will help you reach the right audience. You can target people based on their location, age, interests etc. Above is an image of a Facebook ad. It will appear on your feed just like other posts. You can differentiate an ad by the ‘Sponsored’ tag on the post. Now, Facebook and Instagram accounts are much related. By giving ads on Facebook, you can also place them on the Instagram feed of your target customers. Instagram is a great (mobile-based) way to build a large fan base if you have attractive images to post. With ever lower data rates and everyone getting onto smartphones, the number of people using Instagram has gone up steeply in the recent years. 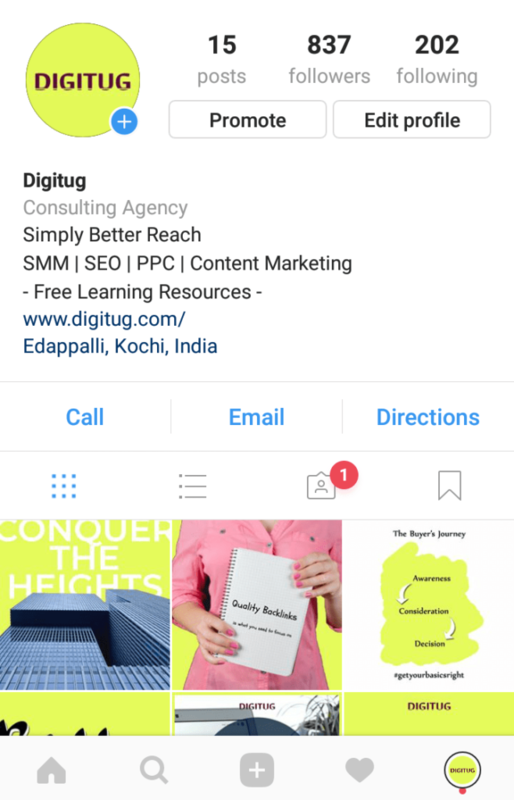 Instagram can be a very good platform to showcase your products and organizational culture. LinkedIn is another great platform to get your brand to people in the industry. You can also share resources related to your domain. Many organizations now hire quality candidates through their LinkedIn page. 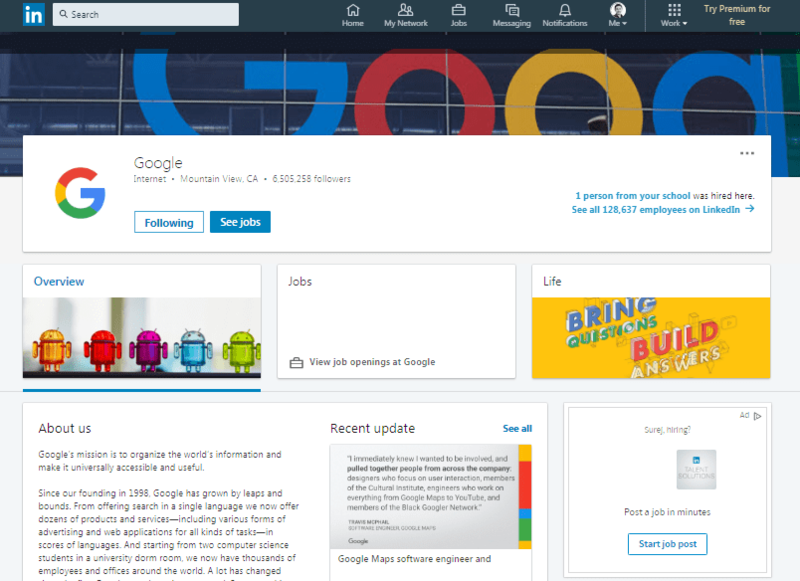 Posting your open positions on LinkedIn might get you some followers as well. Now for the beginners, (of course this article is aimed at them) don’t be confused between Search Engine Marketing and Search Engine Optimization. SEM is paid and SEO is organic (non-paid). We will come to SEO later. 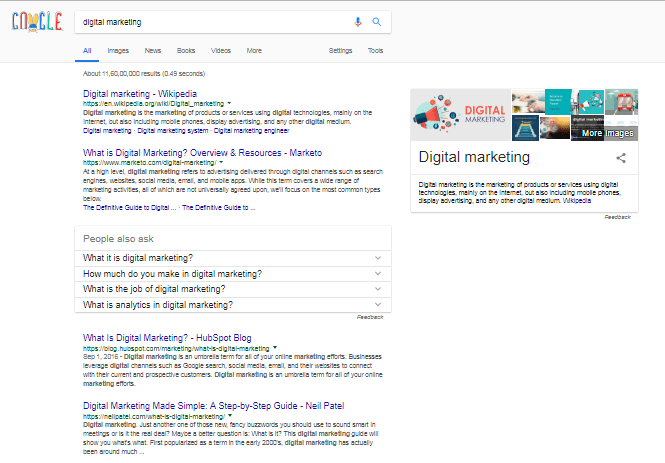 When you search on Google (or any search engine, but Google in 80% of the cases) what you will find is a page full of search results (This page is called SERP – Search Engine Results Page). Every brand out there wants to be on top of the search results and outrank their competitors. There are organic (without paying the search engine) ways to achieve this, but it takes time and effort. Then if you are willing to spend and have someone set it right for you, the top position can be yours. That is where search advertising comes into play. The platform owned by Google that will help you do this is called Google AdWords. Ad Words also follows the PPC (Pay Per Click) Model. Google Ad Words lets you advertise on search results page and Google partner sites. 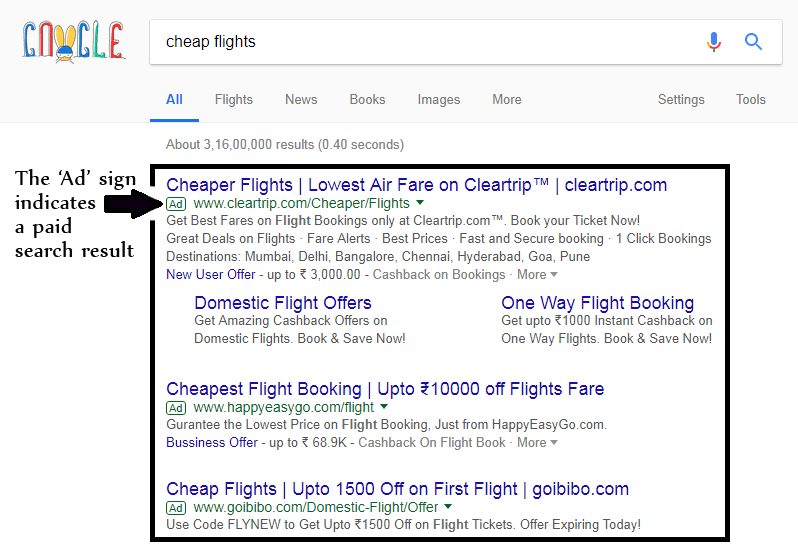 With Google Ad Words you can reach your prospects at the right moment when they are searching for a product. For example, you can be an online store that offers ‘car seat covers’. You can give an Ad Words ad and be on top of the search results on Google when people search for the term ‘car seat covers’. Here the term that you put into the search bar is called Keyword (‘car seat cover’ in this case). There will be many advertisers competing for the top position on the search results page by bidding for the same keyword. In the above example, there will be many car seat cover providers competing for the top position on a SERP. Your position on the SERP will depend on your ad rank. The ad rank is decided by many factors including the quality of your ad and the bid amount. Before trying your hands on an AdWords ad, you can go through the resources available online to have a better understanding. You can even take the Google Academy for Ads’ courses and get certified on search advertising and many others. SEO is the organic way to gain a top position on the SERP (now you know what it is). It is always a good idea to have your site listed on the first page of search results. Because no one literally goes to the second page, okay may be a very less percentage. But however, it really doesn’t matter if you are on the second or third page. Try to rank for at least some keywords on the first page of search results. We are going to see how it is being done. We can broadly classify SEO into two. As the name suggests, On Page SEO is what we do ‘on our web pages’ to make it more visible to the search engines. Let’s have a look at the various techniques that come under On Page SEO. I know these things might sound a little techie for all the newbies. But hang on, as I break them down for you. It is essential that the title tag contains your main keyword. The keyword that you specifically want to rank for. So, if your company offers car seat covers, and if you want to rank for that term in Google search results, it is crucial that you have it in your title tag. Well, this is not the only ranking factor for any website on Google. There are so many other factors. But having your main keyword in your title tag will help search engines understand what your page is all about. 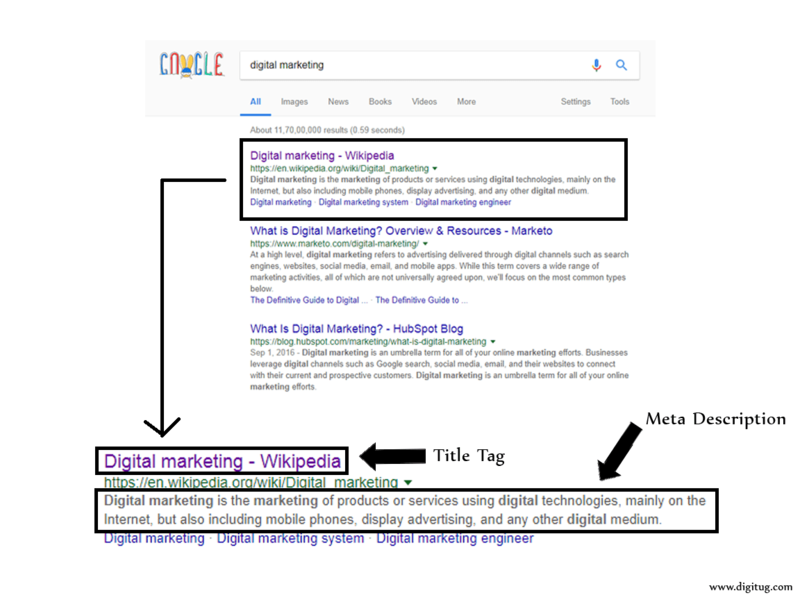 Just like the Title tag, optimizing your Meta Description (See image given below) will also give you a better search presence on Google. Make sure you contain your main keywords in the Meta description. Also, it has to be of an optimal length and should explain your page’s contents in a precise way. Keyword density is the number of times the keyword appears in your content. But some of the recent studies have shown this parameter to be of lesser relevance. People used to stuff keywords into their content in the earlier days of SEO to rank higher. But that is not the case today. Keyword stuffing doesn’t work like before and could even get you penalized by Google for dense usage of keywords. Even then, placing your keyword in the first 100 words of your content does good to your rankings. And above all, publish quality content. Google ranks pages that load fast. So if your page takes more than 4 seconds to load, then there is something that you need to work on. Try compressing the image files and optimize your page for speed. How many of you literally go and turn your laptop on when you want to search for something on Google? I think very less of us do. We use of our mobile phones instead. 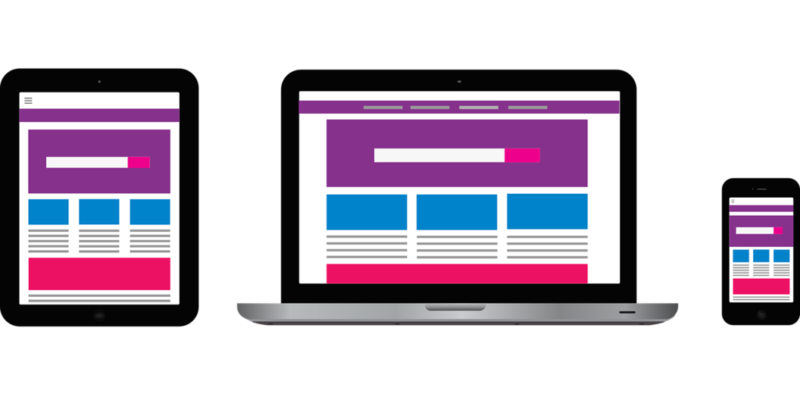 As more of the traffic is moving to mobile phones and other portable devices, Google ranks pages that are responsive for these smaller screens. Okay, to stay under the beginner’s guide title, we will just quickly see some of the other On Page SEO methods as well. You can learn more about On-Page SEO by clicking here. Any SEO activity that you do outside of your website can be called as Off Page SEO. Links are a major part of Off Page SEO. The inbound links that you have on to your website (links from other websites pointing to your site) will considerably improve your search rankings. These links are commonly called ‘Backlinks’. There are many methods of building links to your website. If you have great content, that truly adds value; people will voluntarily link out to your website. This is the best strategy you can ever have, but building such authoritative content and getting links is not very easy as it sounds. Well, there are other techniques that normally people do to build links. These are manual methods. One example could be asking an influencer to share your content. Then there are self-created links which are mostly obtained by posting in forums and blog comments. But relying so much on this technique could put you in trouble as it may be counted as a black hat SEO method (unethical SEO practice). Well, there is something worth mentioning here, even though it is beyond the scope of this beginner’s guide. It is called Broken Link Building. 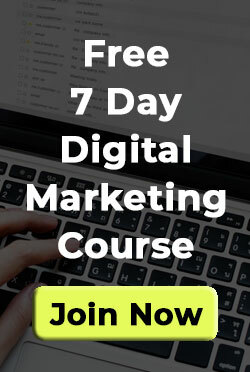 Digital Marketing expert Neil Patel says this is a great method to earn some really valuable links. Go to a website which is reasonably good and has some amount of domain authority. Also, note that it has to be in your niche. ( if you sell ‘car seat covers’ on your site, make sure at least this website is into car accessories or something related). There are tools available to find broken links on any website. Find out these broken links and intimate them about this. Broken links are bad for any website. As you have shown them the broken links on their site, they might offer you a link in return (provided you have good content). Okay, as you might be thinking now, this is not a sure shot deal. But you could actually win some links from authoritative domains. It is all about your effort and the way you take it forward. Apart from all this, there are some more methods that actually work. Have look at the below list. I guess that has thrown some light over the whole SEO area. SEO is not limited to whatever we have covered above. We will see more about SEO in future posts. Content Marketing is a long-term strategy aimed at your target audience. You produce quality content that add value and distribute it among your audience. They slowly start accepting your content and become a group of trusted audience. Once you have built a trustworthy relationship, you offer them your products (sell your products or services) that can really solve their problems. This is it. If you want a proper definition, you can find it here at Content Marketing Institute. A good example is here. Imagine you are selling ‘car accessories’ online. Start posting blogs about car accessories on your website that add value. One such blog topic could be, 10 ways to avoid damaging your leather seat covers. So, people read this and if they find this of value, they will trust you. And they will surely come to you when you an expert in what you are offering. The flow of content here has to be consistent (eg: one blog post every week) in order to build a trusted audience. It should also offer a solution to their problems to ensure value addition. Again the content can be in various forms, not only as blogs. 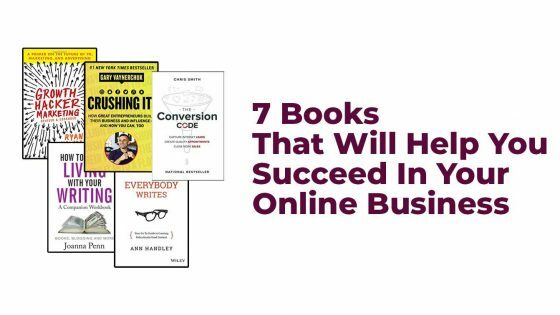 You can offer videos, e-books, webinars and checklists as well. The very first thing, don’t be fooled by people saying email marketing has lost its importance. It is indeed a very powerful tool. Just like the name suggests it is the usage of email to reach your potential customers. If you have been subscribing to emails from Amazon or any other e-commerce site, you will know. Those emails with graphics and product listings, it’s all email marketing. There are plenty of tools available for email marketing today. Some of them are Mail Chimp, AWeber, Constant Contact etc. Depending on the products that you offer, you can customize your mails using templates that are available on these email marketing tools. Now, if you are into blogging, the number of people in your email list will tell a lot about you. You can even use an email marketing tool and integrate it with your website to build your mailing list and automate your mails. As long as you are offering quality content that adds value. The people on your mailing list will continue to praise you. This is one of those ways to make some money online. The idea is simple, imagine this. You have a website that has a decent amount of traffic. And you are telling your website visitors about an interesting product that will help them in some way. You will also be offering a link on your website to purchase the particular product. The link will just drive the customers to the actual seller’s site. Once a visitor has made a purchase, the actual seller will get you a small amount of commission on the sale that occurred. It’s just like getting the commission for a sale that happened through you in the real world. There are people who are running websites and making good amounts through affiliate marketing. Nevertheless, there are people who are spamming our inboxes with affiliate links. This bunch of people has certainly given a bad name for the whole Affiliate Marketing trade. But if executed properly, it does work and can even change your life. So, that’s it. I know it was pretty long, but my only intention was to give you an idea about all those verticals under ‘Digital Marketing’. This post is meant to be a beginner’s guide. 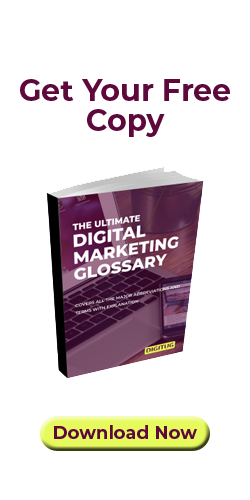 We just saw only the basics of each vertical and I urge everyone reading this post to read more and expand your knowledge in the Digital Marketing domain. It is an ever-evolving field, so I don’t want any of you to be left behind. I will be posting more on Digital Marketing in the coming days. If you found this post to be relevant and informative, please subscribe to our emails. We’ll only send you something that’s valuable. If you have any feedback or questions, please let me know in the comments section. Thank you Jithin. Glad you liked it.